Brent Catlett, an Instructional Technology Teacher in Bellevue, Nebraska and an even better human being, reminded me today of something that I had been wanting to do. I wanted to write a blog post about a really cool feature that I read about last week pertaining to creating e-Pubs within Wikipedia. Yes, I know that Wikipedia isn't the most reliable source, but this could be a way to introduce a topic, activate prior knowledge, or as a general resource for your students. 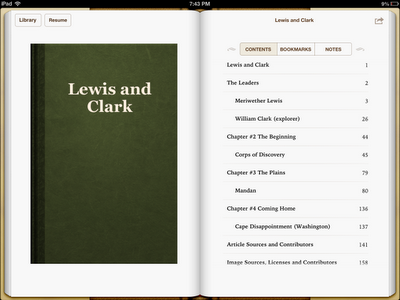 Here is what the finished product looked like when I opened it in iBooks. While creating my first Wikipedia e-Pub (as you watched in the screencast) I used another tool I had been wanting to try called Screencast-o-matic. This is an outstanding screencast tool and better yet, for the basic features most teachers will need, it's FREE! You can upload your completed screencast to the SOM site or YouTube. Perhaps you have to be gone from school. Why not create a screencast of directions for your students? Have your sub show the screencast you created and it's like you were never gone!